Meet Audrey Hitchcock. She’s the owner and operator of Ramini Mozzarella in Tomales, California, one of the very few enterprises in the US making authentic buffalo mozzarella from her own herd of water buffalos. She is a real life Wonder Woman. 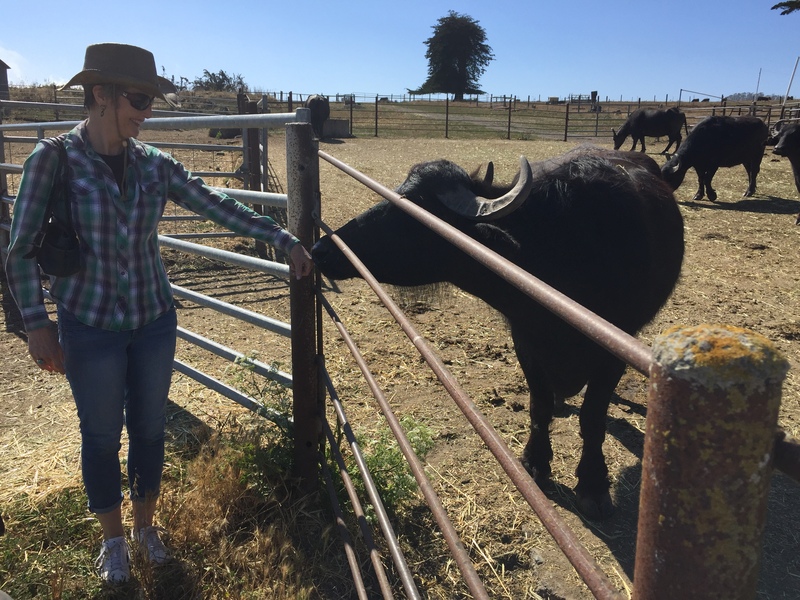 I’ve wanted to visit the Ramini farm ever since I read an article about Audrey in the San Francisco Chronicle: Making Sense of Life and Buffalo Mozzarella (by Beth Spotswood, Oct. 5, 2016). The story rang some very resonant bells for me. For one thing, like Audrey, I too lost my first husband brutally early (he was 54; I was 48). 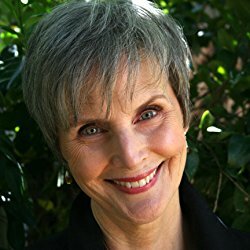 Like her, I took over the family business — in my case, a specialty hardwoods lumber, moulding, and milling business in Pasadena, California — and like her, its demands dictated that I jump right in and work like a pack mule, with very little time for doing what I really felt like, which was curling up on the floor and screaming. Instead, I did my screaming on the way to the shop. And then I’d wipe off my face and get to work, unloading lumber deliveries and making out payroll checks for all two of my employees. 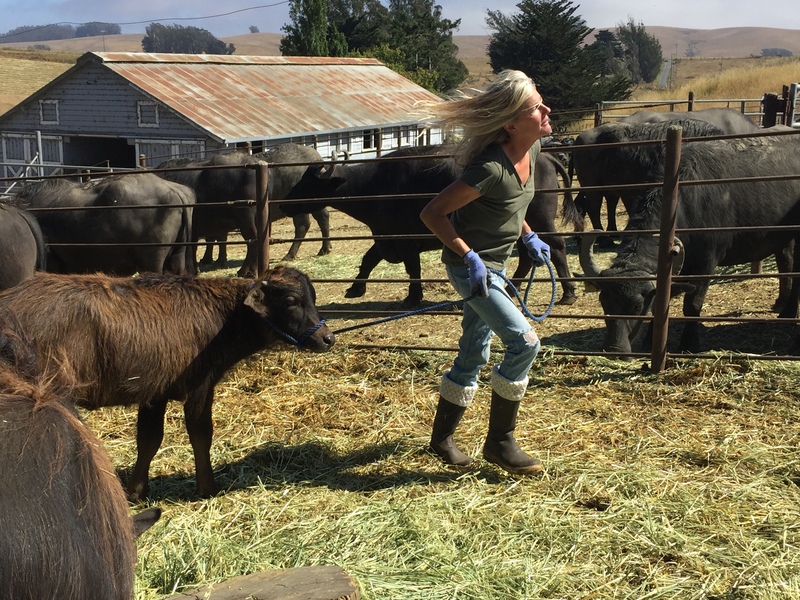 Audrey was left not just with a business that needed tending, but a herd of living, breathing, hungry critters whose needs don’t take days off. Ever. Another point of similarity: I have a thing for water buffalos. They are big beasts with fearsome horns and wet noses who are, when correctly treated, warmly disposed toward people to the point of becoming as affectionate as dogs. There’s nothing quite like buffalo kisses. I know this from personal experience, because back in my college days I had a summer job at a local theme park where I started out as a tour guide and ended up as a performer in a wacky sort of outdoor-arena circus act. In part, that involved riding a huge male water buffalo named Sarge in what was billed at “The Balancing Act.” To cover a set change between the tiger act and the birds of prey, stagehands would haul a monstrously large seesaw into the center of the arena. The head wrangler (Fess Reynolds, a story in himself who would become the paterfamilias of The Gentle Jungle) would ride out on a young giraffe. Another woman would ride out on Sheila the camel. They would take their places at either end of the seesaw and I would ride Sarge up onto the fulcrum point and guide him back and forth, thus raising and lowering the giraffe and camel by turns. The audience reacted with polite if bewildered applause. I rode the camel sometimes, too, along with a docile brahma bull named Frosty and, on one occasion, Taco the llama (Taco was neither polite nor docile). No, I don’t have any photos of myself doing this. I was nineteen and living at home that summer, and I never told my parents. The point is, I became especially fond of Sarge. Michael and me, getting some buffalo love. As a species, the water buffalo has long experience living among humans. In Southeast Asia they are essential beasts of burden. In Italy — and don’t ask me how they got themselves to Italy; I’ve read of one probably apocryphal story involving Hannibal using them to carry his spoils of war back home — they are used to make, well, buffalo mozzarella. 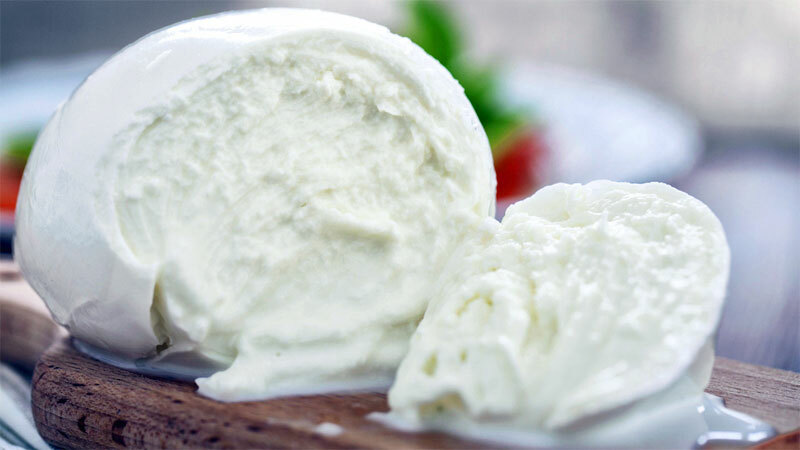 Over the past 1,000 years or so, the Italians have perfected the process, and folks there expect to go to their local shop or farm and pick up a ball of delectable fresh cheese made from milk squeezed out of a buffalo the previous day. The Italians prize their buffalo cheese to the extent that the stuff made from cow’s milk isn’t even called mozzarella: it’s mere fiore de latte, a separate and down-market product, a sad substitute for the real thing. Craig Ramini, Audrey’s late husband and the visionary behind the enterprise, was determined to produce the real thing here in California, in a section of the north coast known that has spawned a community of artisanal cheesemakers, like Cowgirl Creamery and Pt. 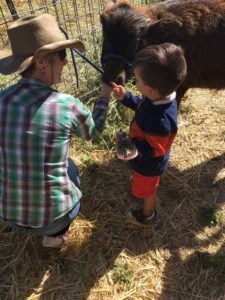 Reyes Farmstead Cheese Company. 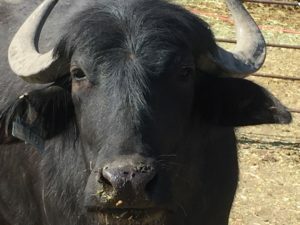 Others have tried and failed at establishing buffalo mozzarella dairies, because the nature of water buffalo makes them incompatible with the typical large-scale American agricultural approach. But Craig and Audrey were all about starting small and focusing on making a delectable product, trusting that profits would follow. Meanwhile, the animals — who, it turns out, only give up their milk when they feel happy and safe — would be treated with kindness and respect. From what I saw, Audrey’s buffs are treated like family members. Most of them are named after rock stars, with a cow’s offspring bearing at least on initial in common with its mother. On the wall of the milking barn, a herd family tree, color-coded, is taking shape. Moreover, none of Audrey’s retired cows or excess males have been sent to slaughter; she has found homes for them in sanctuaries. 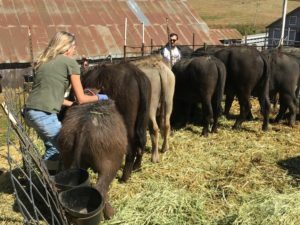 As a volunteer and board member with Sunrise Horse Rescue in Calistoga, CA, this is music to my ears. 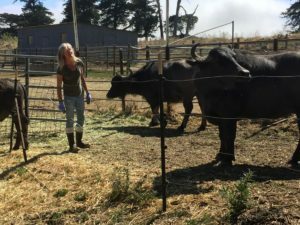 There’s more to Audrey’s bittersweet story, and if you are or ever plan to be anywhere within hailing distance of Tomales (not far from Dillon Beach and fairly close to Pt. Reyes and any number of worthy stops on a NorCal coastal road trip), I urge you to take one of her Saturday afternoon tours and tastings. 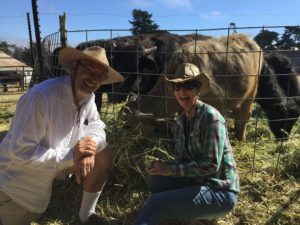 You will be surrounded by beautiful rolling farm country, the soughing of ocean breezes in the cypress trees, the aroma of earth and buffalo poop (not at all unpleasant, at least not to a frustrated cowgirl like me). 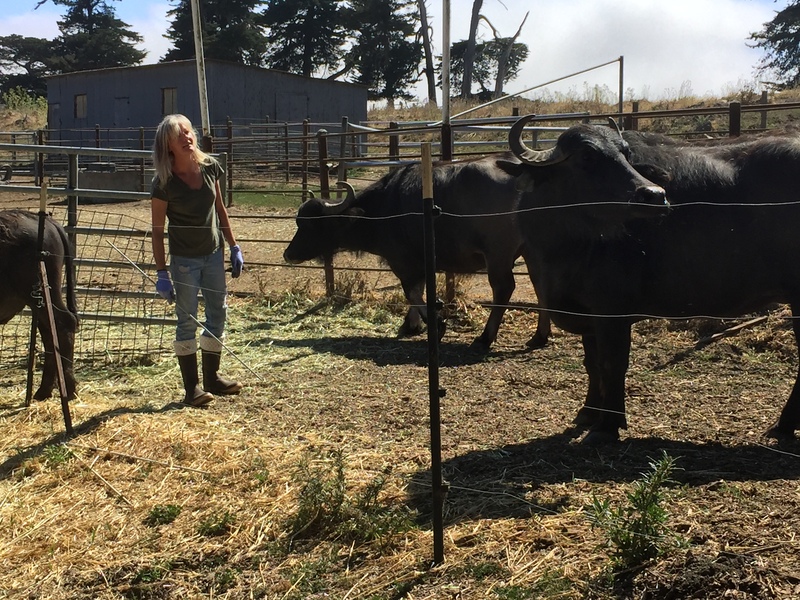 You’ll learn, you’ll be inspired, you’ll get to taste real buffalo mozzarella made right there from the four-legged ladies you’ve just gotten to know. 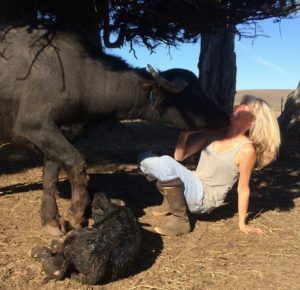 You may get to cozy up to a baby buffalo, and you’ll discover just how charming these creatures can be. Me, with two of my new best friends. There is nothing about Audrey’s life these days that’s easy. But it’s full of heart and meaning, and I am still aglow from our visit with her and her herd. We took some of her girls’ cheese home with us, and I promise you it’s sumptuously, mouth-coatingly delicious. You can taste the love. Do you find Audrey’s story inspiring? What story gems have you discovered in your travels this summer, or in your local surroundings? Please comment and share! Thank you. Beautifully written. Von and I will definitely head out there for a road trip next year. By all means, let us know! And you would love a visit to Ramini. 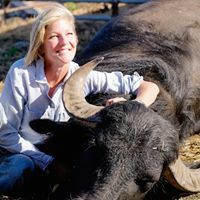 What a lovely story and to think I who adore mozzarella di bufala had no idea we were talking WATER Buffalo here – I was thinking more Home on the Range variety! I cannot shed any light on how these fantastic beasts got to Italy (no doubt the Romans) but I don’t think Hannibal brought them over the Alps. Equally improbably Hannibal schlepped Elephants! Wonderful to find an affinity with someone – and great cheese at the same time! And how in the world are we approaching 40 years of friendship & this is the first I’ve heard about “as a performer in a wacky sort of outdoor-arena circus act.” !!! Surely you should lead with that whenever you meet anyone! Wow – I didn’t know this. 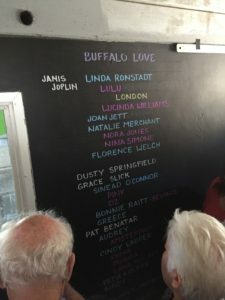 I’d been thinking buffalo mozzarella came from American buffalo. Hitchcock does some beautiful and hard work! Wow. I read every word here voraciously. I’ve spent a lot of time in Calistoga, as well as the Pt. Reyes area, but have not known about Audrey and Ramini Mozzerella. I’m passing this post (and link) to CA friends. And the next time I visit the state, I hope to be able to come to Tamales. Thank you for sharing part of Audrey’s story. Beautiful.